Description: Bangor Federal Credit Union is a business categorized under credit unions, which is part of the larger category credit unions-federally chartered. 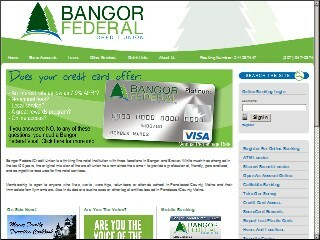 Bangor Federal Credit Union is located at the address 339 Hogan Road, Bangor, ME 04401 in Bangor, Maine 04401-4238. The CEO is Stephen Clark who can be contacted at (207)947-0374. Location & access map for "Bangor Federal Credit Union"